Too Much Competition and Not Enough Fun? Written by Sarasota Sun Devils on March 28, 2019 . Posted in Blog, Football Parents, Youth Football. A common concern that many parents have is, is there too much competition and not enough fun in youth sports? Youth sports provide a lot of benefits to children, ranging from a source of exercise to a way to learn about teamwork. However, is the level of competition too high? Read on to find out. At youth sporting events, you can sometimes see parents who get too into the competitive atmosphere of the event. Sometimes parents take this competitive attitude too far, ruining the fun for the players. Youth sports can be about fun, as long as parents and their children understand how to balance fun with hard work and good sportsmanship. The first level to youth sports is the purely fun level. This is the level where young athletes can play their sport, without feeling any competitive pressure. With purely fun athletic events, children are not influenced by their parents, coaches, or peers to have a competitive attitude. The second level to youth sports is a lot of fun, with some hard work. At this stage, as children get older, they learn about the values of hard work. While they are stilled focused on the joy they get from their sport, they understand that they need to apply some hard work if they want to improve as individuals and as a team. The final stage of youth sports is the fun, with a lot of hard work stage. When a child gets into high school, this is where hard work become a primary focus. At this level, athletes understand the value of hard work and can even enjoy the rewards it brings. Youth sports are still fun for children at this age, but they take their sport a little more seriously, as do their peers. At this point, it’s important for parents to know the line between fun competition and too much competition. Finding a perfect balance is the best way for a child to enjoy the many benefits that youth sports has to offer. Is your child interested in youth sports? 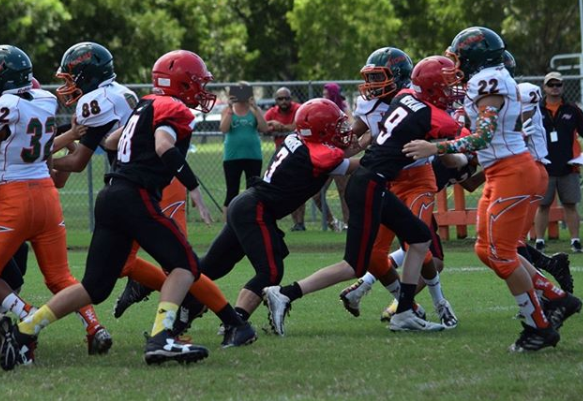 If so, consider football or cheerleading with the Sarasota Sun Devils! Learn more about our organization by visiting our website today!